Actress Kriti Sanon has been busy with her Bollywood projects as well as her brand endorsements and photo shoots. She is often snapped by the paparazzi at events, parties and at the airport. 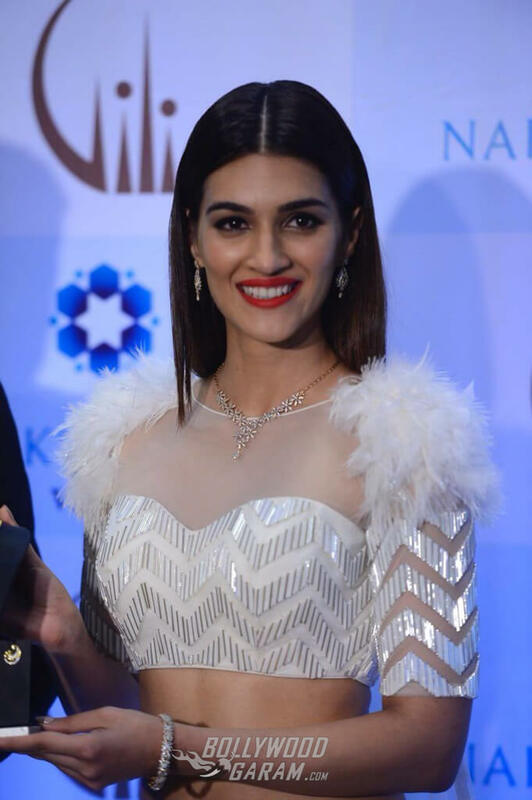 This weekend the actress was seen walking the ramp for the seventh edition of India International Jewellery Week where Gitanjali’s Gili Nakshatra designs exclusively for festive wear were launched at the St. Regis, Mumbai by the new brand ambassador of Nakshatra Gili jewellery (festive collection) – Kriti Sanon. Kriti was a vision in white as she walked the IIJW ramp for designer Archana Kocchar on Saturday, September 23, 2017. She was wearing a floor-length white and silver gown with zigzag patterns and floral motifs along with a splendid diamond neckpiece, matching earrings and bracelet to complete the look. With a centre parting and red lips, Kriti looked sensational and made a grand entrance at the event. She posed for the shutterbugs along with the jewellery design collection and smiled for the cameras. Kriti’s latest look on Sunday, September 24, 2017 night at the Vogue Women Award 2017 event was spectacular as well. She was seen wearing a black gown and looked nothing short of a sensuous diva in the Shivan-Narresh designer outfit with cuts at the waist and a frontal slit. Her golden hoops made the look even more dramatic, not to mention her smoky eyes and open wavy hair. The fresh face of Gili jewellery, Kriti was last seen with Ayushmann Khurana and Rajkummar Rao in Bareilly Ki Barfi that was received well by the audience and critics alike. Exclusive photos of Kriti Sanon at the launch event!